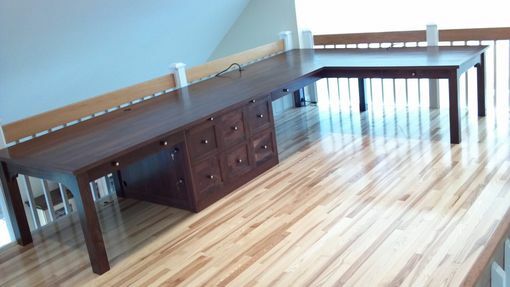 A two person desk located in a loft area. Made of walnut. Dimensions: 14' x 8' x 29"
We are very happy that we run into Jim Eddy through Custommade.com. Jim took our desk ideas and transformed them into an excellent working desk. The quality of his wood work and attention to details is perfect. We now have a unique office desk that is spacy, easy to work with and gorgeous. Jim's choice or wood and leather transformed the tradional office desk into a life style statement. We are very grateful to Jim and looking forward to few other projects. By the way, Jim shipped this across the county and with no scratch. I had to do considerable extra work on the final product in order for the drawers to work properly. I provided the concept drawing and Jim designed the rest. The final product looks fantastic from a small distance. It is in the details of the construction that is disappointing. It has been a little over a year since Jim installed it and I have just recently finished fixing it. After some communication to have Jim complete the project and having him say he would take care of it. I ended up just doing it myself. He never got back with me on this project.